From packets of organic EVOO and nontoxic dish soap to drinking water filtration and recycling services – creating a health-centric kitchen in a vacation rental is not only possible, it’s really fun! I am currently designing a health-focused beach vacation rental on the sunny Emerald Coast of Florida. As I was researching best practices, I thought I would share some of the things I’m considering, in hopes that we can make short-term rentals healthier for everyone! As a vacation rental landlord, it is important to maintain a safe home and kitchen for your renters. While many vacation home rental sites pay lip service to providing safe accommodations, the truth is there isn’t much oversight or follow up. 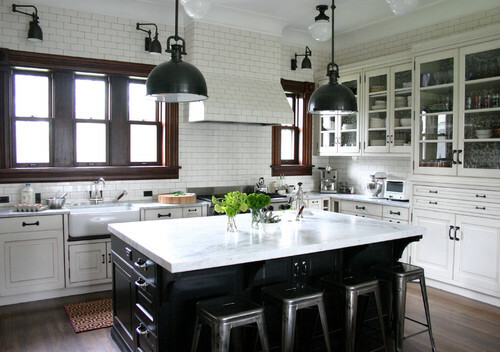 This means that it is up to the hosts themselves to design and maintain a kitchen that is beautiful, functional, and safe. Unfortunately, more than a few people have been carbon monoxide poisoned in temporary housing situations (I’m the crazy lady who takes my travel CO detector with me in the hotel). Have both a carbon monoxide and a smoke detector in your rental, especially if you have gas appliances, and test them as recommended by the manufacturer. Also, if you haven’t already done so, be sure your smoke detector wasn’t one of the half a million that were recalled earlier this year. When setting your water temperature, you are really considering two things: You want water that is hot enough to kill water-borne pathogens such as legionella, but not so hot as to scald people. According to the Consumer Product Safety Commission (CPSC), that ideal temperature is right at 120°F. I worked in quality control at a restaurant and hotel for several years, so food safety is something I’m really adamant about. To avoid bacterial growth, refrigerated goods (especially animal products such as meat and dairy) need to be kept at or below 40°F. Frozen goods should stay below 0°F. Help your guests avoid food-borne pathogens by putting a cheap thermometer in your fridge and freezer and be sure to keep your unit maintained. When it comes to air and water filtration, even most primary residences are woefully inadequate at routine maintenance. In vacation rentals, timely filter changing and routine maintenance are practically non-existent. If you’re willing to take a couple of extra hours and up to $300 over the course of a year, this is an area where your listing can really stand out! Start with an air conditioning unit and ductwork that is clean and mold-free. Use a pleated media filter, ideally with a MERV rating of 11 or higher. Replacing your air filter is your biggest routine maintenance item, be sure to account for who will handle changing it. If you want to take it a step further, you can introduce a quiet portable air filter to the kitchen or sleeping areas. With more and more people unknowingly affected by poor lighting and electromagnetic fields (EMFs), this is one way to take a stellar health-conscious listing to the next level. Of course, lighting and EMF considerations extend far outside the kitchen (even to your neighbor’s house and that nearby cell antenna) so please think holistically when making changes. Not only are those long buzzing eye sores completely and forever out of style, they are absolutely horrific for your biology! I’ll spare you the science lesson and just say that these awful lights, which started polluting kitchens as early as the 1960s, need to go. When you are replacing them, I would consider the healthiest lighting sources, which do not include LEDs, recessed lighting, or dimmable lights. Instead, opt for traditional incandescent lighting. Not only is keeping your toaster plugged in a fire hazard, it creates a strong electromagnetic field in your kitchen. Even when not in use, a toaster produces alarming levels of EMF. Unplugging is a simple hack that provides instant results! The majority of moisture (read: mold) is created in a home through cooking, so the range hood should be running any time the stove top is on. And while getting your renters to comply would be fabulous, wouldn’t it be even better if your range did some passive vapor removal – even without your guest’s buy-in? That is what a vented deep-hooded range hood will do for you – avoid the curved glass type, the “deeper” the hood, the more passive moisture removal will be possible. I know this may be a tough pill for some of my Food Network devotees to swallow, but while it serves a purpose in a restaurant, gas ranges have no place in healthy homes. Combustion gases, including carbon monoxide, in addition to having deadly effects at high levels, are released at lower levels while cooking, are then breathed in, and are at measurable levels in the occupants’ blood within minutes. No gourmet grilled cheese is worth that. Ok, this one hasn’t been entirely settled in our home. Our family doesn’t cook with a microwave (psst…neither should yours! ), but they are so standard that my husband worries that omitting one altogether may harm our ratings. 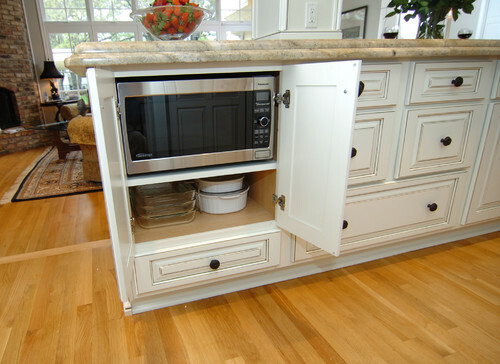 I’m willing to compromise and get a convection/microwave combo (so it has some function outside of denaturing food and filling the home with radiation) and then to hide it behind a cabinet. Can a girl get some healthy cookware? Vacation rental giant, HomeAway, combed their negative reviews and found the single most common complaint was pots and pans. But when it comes to marketing to a discerning clientele, not any old pots and pans will do! I rarely use the cookware in a vacation rental, as it tends to be toxic non-stick cookware that is chipped and scratched. Ew. Keep your cookware inventory clean and with no chips, cracks, or warps. Be sure to offer cooking utensils that will not scratch or damage your cookware. What about dishes and flatware? For dishes, I cannot recommend Corelle highly enough! Their stuff is affordable, durable, and generally stands up to independent testing for lead and other heavy metals. Nothing will make your guests feel more at home (and prompt more 5-star reviews) than a few healthy kitchen staples. In addition to some important basics such as sea salt and pepper and organic tea options, I also like to include at least 2 healthy fats, 2 natural sweeteners, and 2 protein supplements – each macro group having one animal-based option (ghee, honey, and collagen, for instance) and one plant-based or vegan option (EVOO, raw cane sugar, and pea protein, as examples). By the way, this is the box I used for the pantry items (photo above) and this is the box I used for tea bags (photo below) – they look a lot alike, but tea box seems sturdier though it isn’t adjustable like the pantry box. Try these simple tips and tricks to better appeal to healthy renters. This is such a simple accommodation that I believe every health-conscious vacation rental should include it. If your trash service doesn’t offer a recycling program, you may have to collect it between guests and haul it to a local sorting center. In my opinion, this is a small price to pay to help your sustainability-minded guests feel comfortable, as well as to stretch all of your guests to make simple changes in their own lives. While, zero waste accommodations will certainly appeal to a certain audience, I don’t like to inconvenience the majority of renters. In my rentals, I prefer to offer trash and recycling bins together, so it’s super easy to do. I love this all-in-one unit from SimpleHuman! There is a large spectrum on how eco-friendly and health-conscious you want to make your vacation rental. Don’t feel like you need to incorporate every single one of these ideas – just adopt a few of the recommendations at first. As with most things, small steps toward healthy housing will yield big results – especially when it comes to EMF and lighting issues! But beware: there is a fine line between encouraging and facilitating Earth-friendly decisions (such as offering simple recycling options and ) and making your guests feel uncomfortable or inconvenienced (please, no cloth toilet paper in a vacation rental!). So tell me – what’s the coolest health-forward feature you’ve seen in a temporary rental?